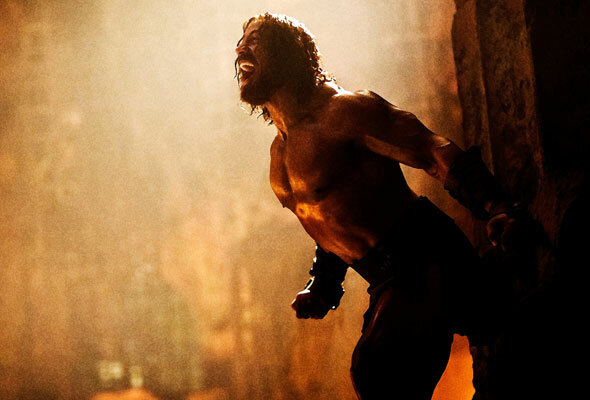 While Johnson has posted some back shots and one black-and-white arty photo before, USA Today has unveiled the first two official publicity stills from Brett Ratner’s “Hercules” film starring Dwayne Johnson. The article also reveals that Johnson awoke at 3:45am each morning, ran on a treadmill, did some gym, spent between 3.5-4.5 hours in the make-up chair, followed by a full day’s work on the movie – a daily routine that went for three months straight. The first trailer for the movie is scheduled be released this coming Tuesday.